For some time I’ve had a mission to find a photograph of the house on Fremont Avenue in downtown Los Angeles where the Alvarado family lived in the late teens and early 1920s. I’ve spent many hours combing through online collections of historical photographs, hoping to find some clue that would give me a window into the neighborhood where my grandmother grew up and was married off at the age of 15, where my granduncle Carlos died in the flu epidemic of 1918, where my great-grandfather died in 1921. Imagine how I feel today; I’ve solved the puzzle and have a photo of that neighborhood and the very house. I recently came across a 1921 map, Baist’s Real Estate Atlas of Surveys of Los Angeles, which shows the actual buildings and addresses of all the structures on Fremont Avenue between Fifth and Sixth. That gave me some orientation and I could see there was a building behind a structure with the addresses 547 and 545. Hey, that would be 543! But how did that bring me any closer to finding a photograph? The answer came today in looking at a photograph of Fremont Street from the USC Digital Library. One of the buildings had a prominent sign: Hotel Knickerbocker. A quick Google search delivered the address of this long-gone hotel: 551 S. Fremont. Which means, according to the Baist map, it was right next door to the building at 545-547 with 543 — the Alvarado residence — behind it. And there it was, the photo I had searched for so long. The Baist map carefully notes the name of the other hotels on the block, but there is a considerably smaller building next to the Alvarado residence in 1921. Clearly the Hotel Knickerbocker must have been built between 1921 and 1925 when the USC archive photo was taken. The photograph of the rear house appears large, but I should point out the 1920 Census records two households as living at that address. Below is the full-size photo from the USC digital archive, entitled Birdseye view of Los Angeles, looking west down Fifth Street and Sixth Street from Fremont Avenue, ca.1925, Title Insurance and Trust / C.C. 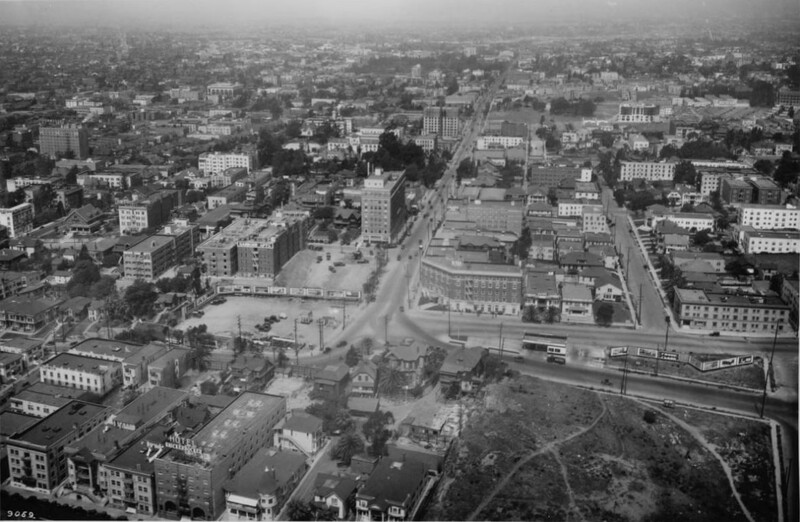 Pierce Photography Collection, 1860-1960, USC Libraries Special Collections. Here’s a photo of Fremont Avenue today from Google Street View, looking north from Sixth Street. And of course the rear house where my grandmother and her family lived was so far back from Fremont Avenue that its location does indeed today lie directly under the Harbor Freeway.